This week, we’ll be unveiling the promotions and giveaways for the upcoming season. We begin today with the specialty jerseys and appearances for the upcoming season. 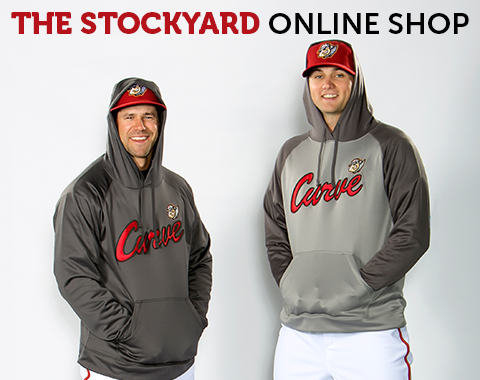 Here are the specialty jerseys (well… four of the five) that the Curve will wear during the 2016 season. The “Mystery Jersey” will be unveiled in a special announcement on March 12, so make sure to stay tuned! On June 18, the team will wear these jerseys featuring the names of those affected by all forms cancer across the uniform in the white area as part of A Game of Hope at PNG Field. The sleeves feature the ribbons with colors representing raising awareness and funds for different forms of cancer. The jerseys will be auctioned online and in the park with the proceeds going to the American Cancer Society Relay for Life. Click here for more information about the night and submitting names for the jersey. For our outdoors enthusiasts here in Central and Western PA, we’ll be hosting Outdoors Night on July 23 as the team hunts for a win over the Akron RubberDucks in these jerseys. The game-worn jerseys will be auctioned with proceeds going to the United Way. On August 26 we will be hosting Tribute to Roberto Clemente Night, will the team sporting these jerseys designed in the style of one of the Pirates’ jerseys from Clemente’s days with Pittsburgh. We will also be giving away a bust figuring of Clemente to the first 1,500 fans, presented by Nuts for You, that we will unveil at a later date. We’ll have some more announcements relating to this night, so stay tuned! On August 27, we will host our first-ever Pro Wrestling Night, featuring WWE Hall of Fame inductee Mick Foley, who was known for his Cactus Jack, Mankind and Dude Love personalities during his wrestling career. The Pirate Parrot will be back for his annual trip to PNG Field on August 26 as part of the previously mentioned Tribute to Roberto Clemente Night. The famous Pierogies and the Bucco Brigade will also be in the ballpark to entertain fans. We’ll celebrate our own Loco’s birthday on July 15 at PNG Field, and the always entertaining SWEETRIGHT BROTHERS will be making their first appearance in Altoona to join in on the celebration! They’ll also be at the park on July 16 to put on their full show. We’ll be announcing the 2016 bobbleheads and other giveaways tomorrow (Feb. 24) so make sure you’re following us on Facebook, Twitter, Instagram and Snapchat to see them! We’ll roll out the entire 2016 promotions schedule on Thursday.